That $500,000 will come in very handy!! Glad all is well with your hand now. I wonder if there will always be a scar. Will Martin Guitars stop using me as a hand model? I guess I'll just use the $500,000 to make up for lost modeling revenues. Wait. How much does a Porsche cost these days? @TheHorse Well, a I know a 2019 Porsche Cayman costs around $60,000 so you will have plenty of cash left over. Glad to hear it is better. Could I borrow 100,000 of that? Not a problem. I am going to ask Barrister Mbalo to send you $100,000 of what he is sending me. May I have all of your bank information, please? Well looky there! Doctor Horse. Well, technically, I AM a Doctor. @TheHorse Ohhhhh! excuse me. Hey Doc Colin, when I move my head to the left my neck hurts, what should I do? @andriaperry Andria, well, I'm a research psychologist. But I'd say massage the heck out of it. Better yet, get Mr. Andria to massage the heck out of your neck. The endorphins and oxytocin released when you get a good neck rub with reduce pain and increase your overall sense of well-being. The thing with burns is to stop them getting infected. For some reason, burns seem to get infected very easily. I'm glad that mine did not. I wonder why they often get infected. @TheHorse I think it is because most burns destroy the three layers of skin or whatever it is we have. @JudyEv I heard it was seven in childhood. But I've never researched it since. The next time remember NOT to apply ice, but to put the injured hand under running water for at least 15 minutes. I am an expert on burnings. Do you know the theory behind that? @TheHorse Yes, because the doctor told me. Putting ice on a burn can cause frostbite and damage the skin. For good results, run cool water over the area for at least 5 minutes and take a pain reliever if the pain is serious. Then apply a a moisturizing lotion, and protect the burn from friction. I had a serious burn and I cannot even see the scar. Am glad you felt better now. An xray or CT scan would be good, if I were you. Thanks for the thought. I played guitar and bass right after the injury, and movement of my hand and fingers were not affected. I decided that it was "just a flesh wound," to quote Monty Python. Glad your hand has healed and all is well. I personally wouldn't have went to the ER for that injury. There is no need. However, I would have put some aloe goop on it, from an aloe plant. That would have took the sting out and helped the healing process greatly. Yeah, my first concern was to stop the "cooking." I applied ice and then cold water. Then I applied the antibiotic ointment after that every morning and evening for about two weeks. I really only hurt badly when I accidentally brushed it against something. @TheHorse Next time, I highly recommend the aloe. I remember something about your not supposed to put ice or cold water on a burn. @AngelizaQT It worked fine for me. I heard you're not supposed to put butter on a burn. When we were in Florida we DID put fresh aloe on our sunburns. It grew everywhere! If I can avoid hospitals and doctors, I do. @TheHorse That is not a bad thing at all! @rhpinc I just got some new glasses! That was actually kind of fun. I'm glad to hear that your hand healed nicely. Yay! Hopefully I'll avoid doing something that stupid again. @TheHorse I missed that part of how the injury occurred. @kareng It was brutal, and painful, but i had a sense that I'd be OK long-term. Hmm. I hadn't thought of that. How many of us are there? @simone10 What a popular site we're on! Looks good! I'm surprised you got so little on your GoFundMe. I thought you would get so much more! I think people are selfish these days. I was hoping for a couple of million. Just to supplement my MyLot earnings. @TheHorse What is this world coming to? @1hopefulman I love my Nisan Xterrra with 200,000 miles on it. But a Porsche sounds tempting. I'll have to check whether I can haul guitars and amplifers in such a vehicle. I am so happy that it all went well Horse! I will practice some guitar tonight. @TheHorse But what about recovering first? Do you feel completely recovered? @jvicentevalera Yes. I think it's recovered completely. I must have missed the original post. Happy to hear that it healed. Like you I'm not extremely likely to run to the doctor with an injury. It's pretty dramatic when I do head to the ER. Last time was for a torn hamstring after a fall on the ice. I'm fully recovered...and other than X-rays there was no treatment. Hamstrings can be a pain. I pulled one rounding third in softball a few years ago, and I've always worried about it since. I missed several weeks. When I tore my ACL (also in softball) it was a different matter. I had (successful) surgery. @TheHorse it was several weeks before I could actually sit on a chair and six months before I could walk any distance without some pain. @Morleyhunt When I see someone pull a hammie I instinctively wince. I'm not surprised it took so long. Glad your hand has healed satisfactorily. I wonder if the scar will fade over time. @TheHorse You could try putting vitamin E oil on it, but most of my childhood scars are still visible. Would you share the GoFundMe money? I want to go on vacation and desperately need to remodel my bathroom. Where do you want to go? When Barrister Mbalo sends me the money he promised I can share that with you--no problem. @TheHorse The Caribbean would be nice. Would that barrister be the same that once in a while tells me that I have an inheritance? Glad your hand is better. Thanks, Jessica. 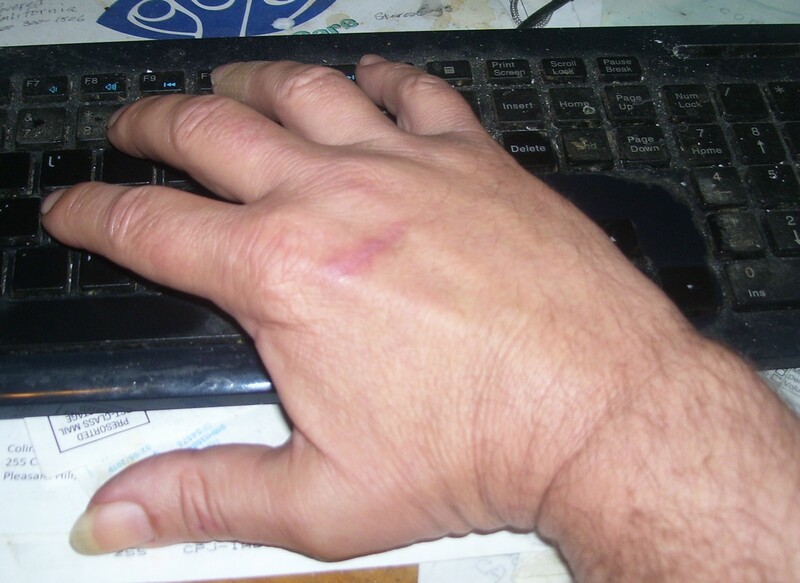 I hope the scar goes away so I can return to my hand modeling career (Seinfeld reference). Is that all you got for your GoFundMe. You should have much more. Still it is a lot so spend it wisely. Prehaps I'll move up the delivery date on my MyLot Porsche. Glad you are doing good without an ER trip. I figured they'd do pretty much what I did. Great that your hand is better. Will you be sharing your riches with us mylotters? Glad to know that your hand has healed.